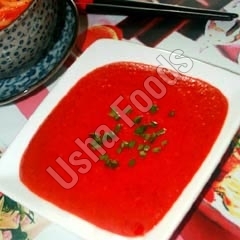 Schezwan Chutney is a fusion of indo-chinese recipe of spicy and hot red chili. Based in Maharashtra (India), we are credible Spicy Schezwan Chutney Manufacturer, Supplier and Exporter. Prepared from red chilies, garlic and bit of shallots, our Schezwan Chutney can be served as condiment with Fried Rice, Noodles, Potato Wedges or Patties, French Fries, Corn Patties, Burgers, Spring Rolls and Vegetarian Dim Sum.